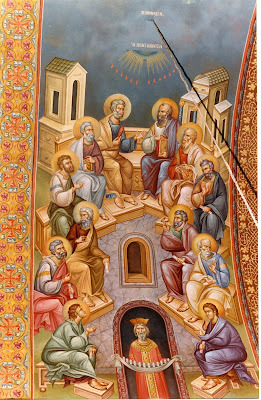 And today, my beloved, we have Pentecost, the great feast which is the fulfillment of the work of the divine economy, and signified the descent of the Holy Spirit. 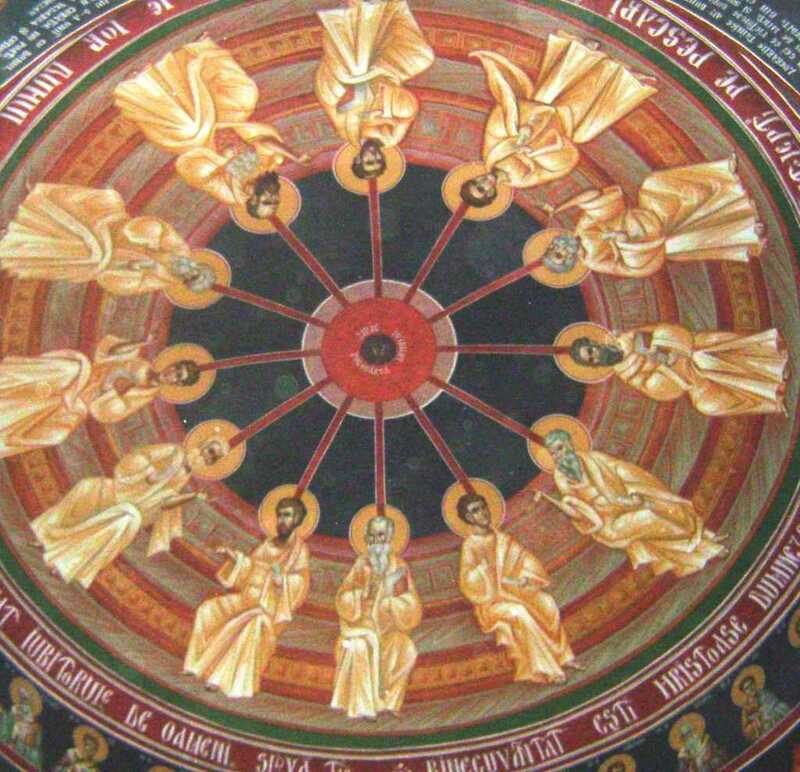 If you go to Mount Athos, in the Byzantine churches, you will see how Pentecost is depicted. Byzantine iconographers, not like those today who are merchants of Christ, were artists who painted with faith and mixed their paints with their tears, and fasted in order to depict the icon of Christ and the Panagia, creating wonderworking icons. Out of ten-thousand icons today, I doubt if we would find one which is wonderworking. Every icon of course has its worth, due to whom it depicts, but another grace comes from the eye and hand of a sanctified iconographer. I hesitate furthermore, for Pentecost is a feast which is the most difficult for a preacher among all the other topics. For what are we? Nature, worms, unclean animals, lowly-people, sinners, “having unclean lips among a people of unclean lips.” (Isaiah 6:5) How can we speak today regarding the Holy Spirit, in an age which is known for its atheistic speeches, heresies, and generalized corruption? In my place should be one of the Holy Fathers, whose spirits were intangible, and had not a molecule of carnality, and who, when they were praying, did not walk on the earth. And you, my listeners, should be purified, so that our spirits would be in harmony, and so that we be exalted above the heavens, like the Holy Apostles, so that the Holy Spirit would come upon us as well. Behold why I hesitate to speak. But one phrase from today's prayers from the Kneeling Vespers helps to remove my hesitation. Believe me, I would not have even broached the topic, unless those words had strengthened me: “For in fear I stand before You, casting my soul's despair into the sea of Your mercy.” (From the Third Prayer of the Kneeling Vespers) I stand, it says, with fear before you, O Lord, and I the sinner, throw my soul's despair into the abyss of Your mercy. I therefore throw myself into the incomparable mercy of God, and calling upon the grace of the Holy Spirit, I dare to utter a few words. For more properly, I don't speak myself; I become a microphone so that the opinions of the Fathers of our Church can be heard. Pentecost! “I will pour out my Spirit upon all flesh...” The pouring out of the grace of the Holy Spirit, my beloved, in the Holy Scriptures and according to the Fathers of the Church, is characterized by many names. From all of this, I will take one alone, the name “gift”. Why is it called this? Because it is the culmination of everything that God has granted and continues to grant to us. The grace of the Holy Spirit is not the only good thing which mankind has received from God. “In Him we live and move and have our being”, says the Apostle Paul (Acts 17:28), borrowing a phrase from the ancient poet (Aratos). We swim within the abyss of the energies and the gifts of God. What is there that we don't have as a gift from God! I leave the gifts of the earth and the sea. I bring to mind the greatest gifts which come from on high, from heaven. The first [great gift] is light, those countless rays of the sun, which travel at breakneck speeds, covering unimaginable distances. As one Saint said, every ray of the sun which shines upon a flower, a child, an old man, a beggar, a condemned man, upon the face of every person, what is it? It is an embrace by the heavenly Father. The hour when you sense the ray of the sun enlighten and warm you, it is as if God is saying: “O man, I love you.” How much would we pay for how many millions of kilowatts of energy from the sun? And instead of saying thank you, instead of “Glory to You Who has shown forth the light” (The Doxology), God receives blasphemies! And regardless, He sends His light “upon the thankless and sinners” (Luke 6:35). Another is the air. Like the fish which swim in the water, and couldn't live outside of it, thus does man life within the ocean of the air. And only Earth has this atmospheric air. If we removed the atmosphere, we would die of asphyxia. Because of this, the astronauts carry with them Oxygen tanks. And think of how much it would cost if the Oxygen were sold by pharmacists. Only a few rich people could afford it. And for this, again there is thanklessness and ingratitude that our good God receives. Besides these ordinary gifts of God, however, there are also extraordinary gifts, such as in the Old Testament, the manna, that sweet water, which was received by the mouths of the Jews who desired them. And those thankless ones watered the Son of the Virgin “with gall instead of mana” (hymn from Holy Friday). This is what man is. Listen, my beloved, that up till now all of these gifts benefit me here. I told you understandable and simple things that we all know and can experience, and which penetrate our lives. But man is not designed for here alone, for only this natural sphere, for the life of the body. He is not just a body. He is also a spirit, and primarily a spirit. He therefore, has another life, a life in the sphere of the spirit. And there, in the sphere of the spirit, he has need of other provisions. How can I make you understand? I seek the grace and the power of God. Above all physical gifts which we sense, because we live with them and depend on them, is another great and uplifted gift. All of those gifts, ordinary and extraordinary, are small. Today's great gift is the Holy Spirit. “Taste of the gift of the Holy Spirit” (Acts 2:38) Great and necessary for our life is the light, the water, the air, but all of these are simply icons and symbols of that great gift, which is called the Holy Spirit. The Holy Spirit has come! God has fulfilled His promises. It was prophesied of in the Old Testament by the Prophet Joel. It was the promise of Christ to His disciples, before He ascended into the Heavens. It was the completion of the work of the divine economy, the grand work of God for the salvation and glory of fallen man. Without the gift of the Holy Spirit, the work of the divine economy would be imperfect and incomplete. Today, this work is completed. Glory to the Father and to the Son and to the Holy Spirit! On the Monday of the Holy Spirit, 1961. "The third hour was made rich with grace..."
Son, Father, Spirit, blessed are you. "St. Sebastian Dabovich (1863-1940) has the distinction of being the first person born in the United States of America to be ordained as an Orthodox priest, and also the first native-born American to be tonsured as an Orthodox monk. His greatest distinction, however, lies in the tremendous apostolic, pastoral, and literary work that he accomplished during the forty-eight years of his priestly ministry... St. Nicholai (Velimirovich) of Zhicha, Serbia, who buried Fr. Sebastian at the Zhicha Monastery when the latter reposed there in 1940, called him “a viceless man” and fittingly designated him “the greatest Serbian missionary of modern times.” (for a fuller life of St. Sebastian, see here) His feast has been designated as November 30th. E.P. from Eurytania, when he visited his homeland [Greece], got gravely sick from pneumonia, internal infection and cardiopathy. He was approaching his death. The doctors tried in vain to save him. He was battling with death for forty days. One day, a lawyer friend of the sick man came to visit him from Volos. He told the despairing mother of the sick man that, once in Halkida, he heard someone talking about some St. John the Russian. The sick man, as he relates, was in such a terrible state that he could not sense, and could not follow what was going on around him. He only heard the word "Russian". The next day, the man who was healed relates: "My state got even more dangerous. I couldn't sleep, but passed the hours in agony. I was awaiting my death. Then straightaway, I sensed that I wanted to sleep, and I fell into a very deep sleep. "Immediately, the Saint disappeared from my room. In the morning when I awoke, I felt that my state had improved. This was confirmed by the doctor that visited me that day. "As soon as I awoke, I called my relatives, and with emotion I related the strange dream. However, I and some of my relatives did not know anything about such a Saint. And only the Priest, Fr. Lambros, informed me that day in reality that I was saved by St. John the Russian, whose body remains whole [and incorrupt] outside of Halkida. "In five days, I became totally well, and I will never forget the divine intervention of the Saint on behalf of my life. From my great gratitude towards the Saint, and in order to show my faith, I went to venerate the Holy Relics. This miracle occurred in 1937." "This is truly the King of glory. And why are Your garments scarlet?" Thus says the Lord: Walk, go through my gates; prepare my way and make a way for my people, and cast the stones out of the way; raise up a standard for the nations. For see, the Lord has made it heard to the ends of the earth: Say to the daughter of Sion: See, your Saviour has come, and his reward is with him, and his work before his face. And he will call it a holy people, redeemed by the Lord; while you will be called a city sought after, and not forsaken. Who is this who comes from Edom, the scarlet of his garments from Bosor, thus beautiful in his apparel? He cries out with much strength. I reason of justice and judgement of salvation. Why are your garments red, and your clothing as from a trodden winepress? I am full of the trodden grape; I have trampled the winepress quite alone, and no man from the nations was with me. I have remembered the mercy of the Lord, I will recall the Lord’s virtues, the Lord’s praise for all the things with which He rewards us. The Lord is a good judge for the house of Israel; he deals with us according to his mercy and according to the multitude of his justice. And he said: Are you not my people? Children will surely not be rebellious; and he became for them salvation out of their every distress. It was not an emissary, not an Angel, but the Lord himself saved them because he loved them and spared them. He redeemed them and took them up and exalted them all the days of the age. As you were taken up from the mount of Olives, the powers seeing you cried one to the other: Who is this? And they were told: This is the Mighty One, the Powerful, this is the Powerful in war, this is truly the King of glory. And why are your garments scarlet? He has come from Bosor, that is, from the flesh. But as God seated at the right hand of the Majesty you have sent us the Holy Spirit, to guide and save our souls. -Idiomelon of the Aposticha for the Feast of the Ascension, in the Second Tone. I once saw an eagle seated on a stone high up in the mountains of Grevena--it was a golden eagle--and I was amazed. And straightaway, I see it open its great wings and to fly. And I kept looking at it ascend into the air, ascend high, very high, as it turned into a small dot, and ultimately disappeared into the skies. The same occurred with Christ, Whom is named an eagle by the Revelation (12:14). It is Him Who have power to birds to fly, wouldn’t He have the same power? Christ--to use a modern tongue--like the airplane which breaks through the clouds, ascended. And the disciples gazed at Him ascending. 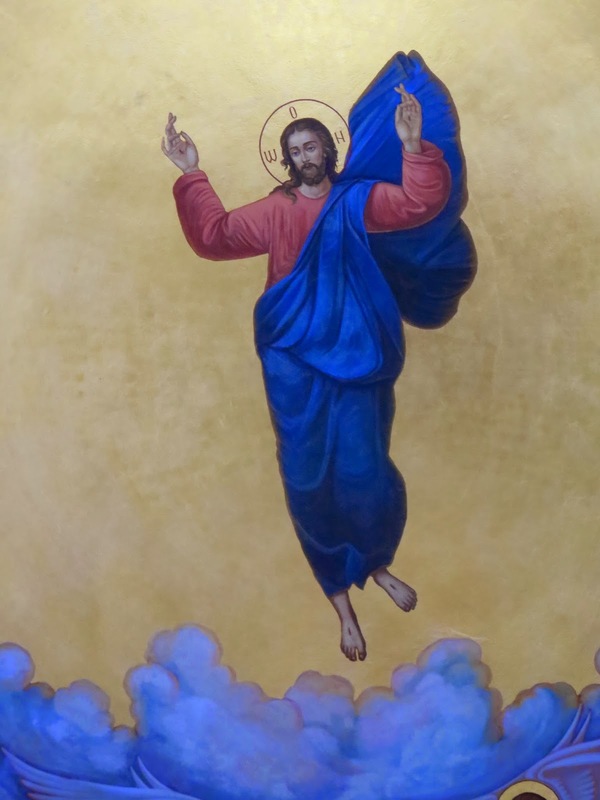 The Lord “ascended to heaven” today, and “sat at the right hand of God” (Mark 16:19). Then two angels appeared and told them: “Why are you standing looking at heaven? This Jesus that ascended, will return again in the same manner." Yes, He will come. What are we thinking? --Who will come! Are you are telling us fairy tales now? Yes, the Lord will come “in [great] glory” (Matthew 24:30), to the wailing of the demons, to judge the whole “world in righteousness” (Acts 17:31). The Lord will come: joy to the righteous, and sadness to the sinners. This is the story of the feast. 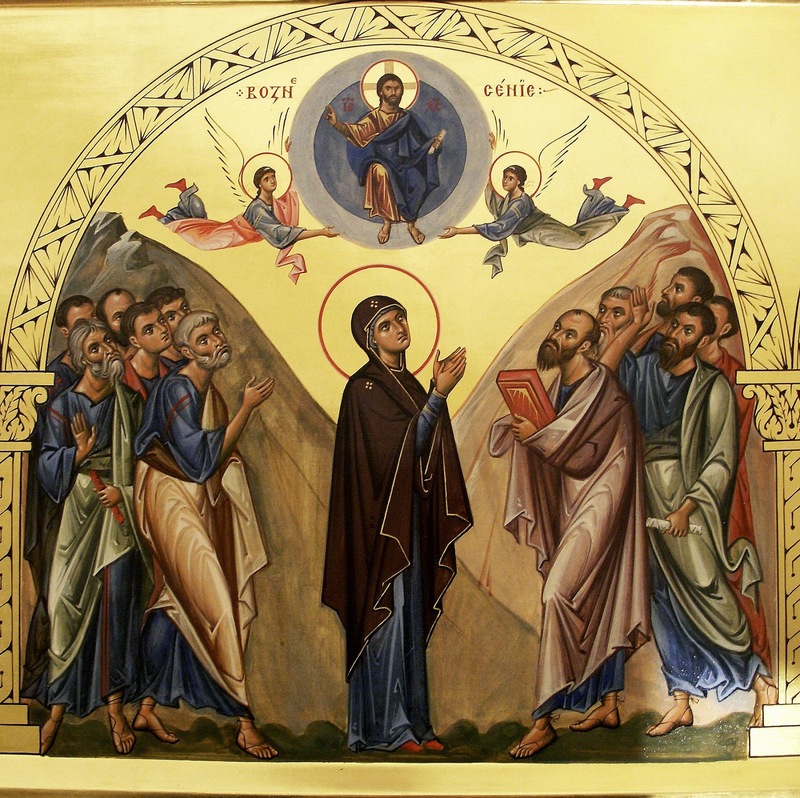 From everything we have said, let us pay attention to one thing: that the disciples and the Panagia remained looking up at heaven. They did not look down at the earth. They were looking high up. What does this mean? From the creations of God, the four-legged creatures walk with their heads looking down. Only man was created to walk upright. Many say that this is a wonder. And the word “human” (“anthropos” in Greek), if we look at it etymologically, what does it mean? It means he who faces upwards. He looks on high, for he was created for the heavens. Is this perhaps a hyperbole? ...When you get up in the morning, and see the sun shining brightly, you should say: “Glory to You, O God”, “Glory unto You Who have shown forth the light” (Great Doxology). Nothing. You go out to go to work. Entreat God, and make the sign of the Cross. But not even one Cross [do we do]. Noon comes, you at the table for lunch, you have all good things: say a prayer. Nothing without thanksgiving. When you drink water, you should say thank you. When you eat bread, you should say thank you. The situation is becoming like swine. Have in mind that famine is coming, a great famine, and our bread will be little. How it was in the older years! I remember in my village, around 1910, there were some older people who had not gone to school, neither high school nor college. Before they drank a cup of water, they made the sign of the Cross. And do you see anyone do it now? Because of this I tell you, the hour is coming that there will be a shortage of water, and fountains and springs, rivers and lakes will be dry, the water will become twice as valuable. And then, a glass of water will cost a lira! As St. Kosmas Aitolos prophesied, a handful of flour will cost a handful of gold. We will be punished for our swine-like state, where we live like animals, without being raised, without exalted thoughts, and in some ways being worse that animals. Do you see the dog? You toss him a bone, and though he doesn’t have a tongue, he turns to you as if to say: “Master, thank you.” Thankless and pitiless people, who often times blaspheme God night and day. This is how it is, therefore. We are lower than animals. There is not the time to develop the theme and explain the word of the Psalms which says: “Man cannot abide in his pomp, he is like the beasts that perish.” (Psalms (Septuagint) 48:13). He is equal to, and sometimes lower than the animals (oxen, sheep, goats) and birds. On the domes and bell-towers of churches, we see the birds’ nests. What should we say about the stork? The stork loves his children, and they love him. When a stork gets old, do you know what occurs? His children bring him food. And because the old stork is shedding and cold, they warm him with their wings! And man? When he doesn’t have ideals, resurrections, exaltations, and great ideas, what should we say of man? Tell me what he thinks about at midnight, and I’ll tell you that he is. If he thinks of money, rewards, women, other earthly things, then what is he? A small and insignificant being. It is said, my beloved, that the pig, as we mentioned, that has its head turned down and eats clay, only once looks up to see heaven. When? When the butcher takes him to slaughter him. This also occurs with many people. They don’t think about God, they don’t step foot in church, they don’t pray. And they think that it will always be thus. However, the hour of death comes. Then, at the last instant, the Archangel will come with his sword, and they will only then remember God. We were not created for the earth, which is a handful of sand, a drop amidst the universe. Is it worth it, O man, for a handful of sand or a drop of water to wage wars and shed blood of humanity? We have departed from God. Because of this: “Let us lift up our hearts.” (Divine Liturgy). And not just today, but the whole year. This is what the Ascension means. In every Divine Liturgy we honor the Ascension. When the Priest says: “Let us lift up our hearts”, what does he mean? Gaze on high, for you were created for heaven, for great and uplifted things. This does not mean indifference for this present life, no. If we embrace the whole Gospel of Christ, this earth will become Paradise. Now, old, young, grandfathers, bishops, right-wing, left-wing, white, black, in many ways we have trampled upon the Gospel, and this earth has become hell. May we repent. May our Lord Jesus Christ bless everyone, Whom, O children of the Greeks, praise and exalt supremely, unto all the ages. Amen. Fr. John Karastamatis was a Greek Orthodox priest, originally from the island of Andros in Greece. He later served in many places in the United States, and was known for his virtue and love to spread the Orthodox faith. He was killed on May 19th, 1985 in the church were he was serving in Santa Cruz. From the radiant life that he led, from his brutal sacrifice for Christ at the hands of satanists, and for the miracles that bear witness to his holiness, many throughout the world hold him to be a Saint and a new Hieromartyr of the Church, though he has yet to be officially acknowledged so by the Ecumenical Patriarchate. Out of reverence for him, a service has been written in his honor (likely by Nun Isidora the Hymnographer, from source), and I provide my amateur translation of some selections below for any whom they would benefit. May the Lord continue to grant help and consolation to his family and his flock, and may we imitate his life, his faith, and his willingness to give his life for Christ! Let us rejoice and exult in you, in the joy of the Resurrection, O Hieromartyr John of Santa Cruz. For your rejoicing has become joy for all the Orthodox. What mystagogy occurred on that night? You offered your fervor to the incorruptible Bridegroom, Who says: “Those who love me, I will love.” The Beloved therefore revealed His mystery to him whom He loved. Therefore, you were made worthy to resemble the Master’s passion, and were made worthy to resemble His glory. Therefore, as you now are at the Master’s bosom at His banquet, you have found all mercy. 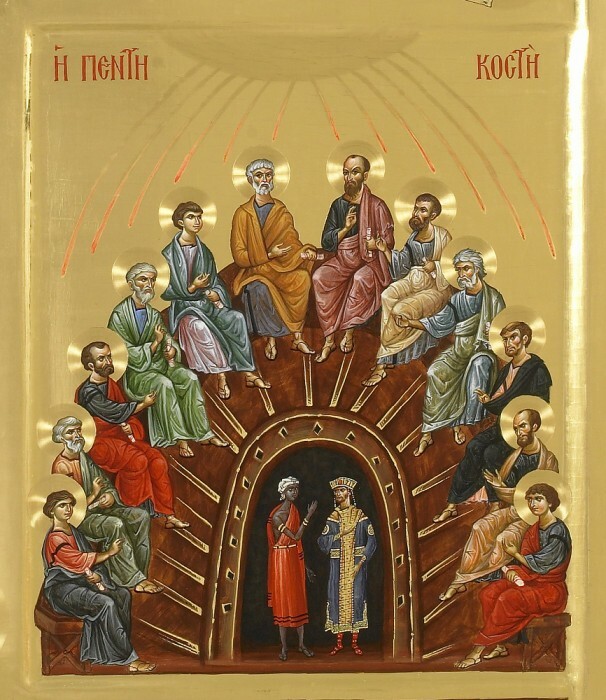 The radiance of the New World, and from the root of Andros, the glory of Hieromartyrs, let us honor John, for he was slaughtered in the Church on behalf of Christ, and shown forth perfectly in Santa Cruz, and he calls all the Orthodox everywhere to cry out: glory to Christ Who glorified you, glory to Him Who crowned you, glory to Him Who showed you to be a wondrous protector of the nations. 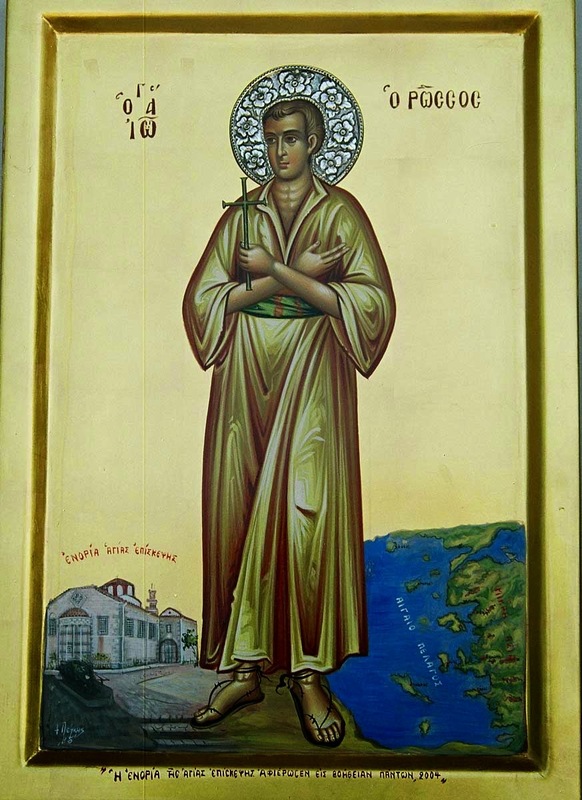 O John, you served your sacrifice in imitation of Christ, and were shown to be the adornment of Andros, and a God-inspired Apostle to Alaska, but as you laid down your life for your sheep, you now grant the gifts of wonders to those who cry out: Rejoice, O all-joyous Martyr. Rejoice, drop of mystical renewal. Rejoice, you who strengthen those who entreat you with fervor. Rejoice, new ladder leading to the skies. Rejoice, newly-woven crown of martyrdom. Rejoice, icon of divine sacrifice. On the 19th of this month (May), the Holy New Hieromartyr John the Priest, who was killed in the city of Santa Cruz in America in the year 1985, by satanists. 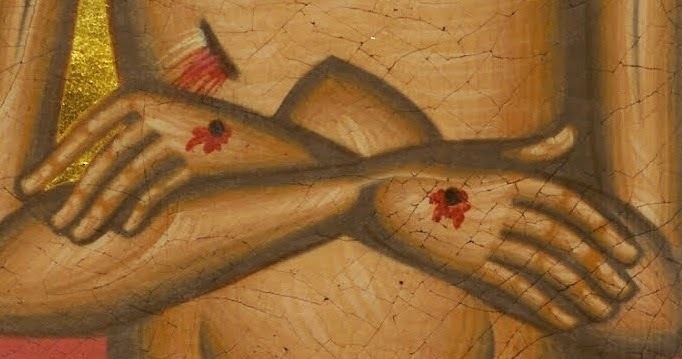 O John, and you also became a sacrifice of blood. On the nineteenth, John was violently flayed. Pour forth, pour forth from your myrrh, O all-pure Lady of Andros, for the resurrectional joy of spring has called us together to hymn your mystic. For he himself became the fragrance of Christ, like pure nard offered to the Church. What could be higher that to be born again for Him Whom you love, and to be received by Him Whom you desire? For he says, “I am wounded by Your love!” Therefore, this wound became your boast, as you offered yourself as a martyrical sacrifice, prepared for the Master. Your soul, as a purified bride, was received by the Bridegroom into incorrupt eternity, O Hieromartyr John of Santa Cruz. And ever intercede, that our souls be shown mercy. 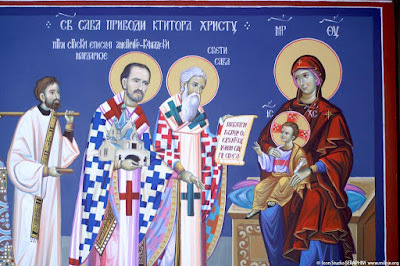 Rejoice, the light of the New World, rejoice, root from Andros, rejoice, the fragrance of the Theotokos, rejoice the joyous consolation of the Orthodox, and protector of Santa Cruz, O universal Father. 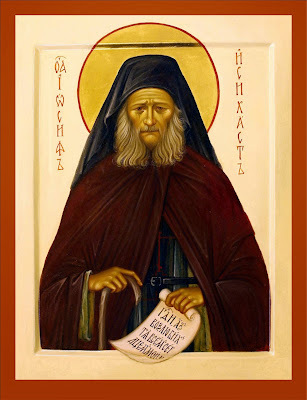 As time passes, it has been disheartening for me to see more and more slander and hatred directed towards Elder Ephraim of Philotheou (now Arizona), and the monasteries which he helped to build in America. I do not know what is in the minds and hearts of those who write condemnations about this great man and his work, which continues to be strengthened through the Grace of the Holy Spirit. In short, all that I can say is that I have seen first-hand what a great blessing that we all have been given. As for myself, I have never, ever seen anything (in many readings of his, in visits to monasteries, in meetings and discussions with monks and nuns from throughout the world) that is out of line from true Orthodox tradition. What I have seen consistently is a love for patience, prayer, ascesis, forgiveness, humility and love: essentially, an angelic life that is Orthodoxy. I have seen time and time again how such love then transforms other people's lives, making their hearts aflame with the love for Christ and for their fellow men. And this is how it is meant to be, as St. John Climacus writes: "Angels are a light for monks, and the monastic life is a light for men." I do not intend this to be a formal defense of Orthodox Monasticism in the country, but just to give my perspective on events as I have seen them. As today is the Sunday of the Blind Man, I pray that we might be like him who allowed the Lord to heal his physical and spiritual blindness. 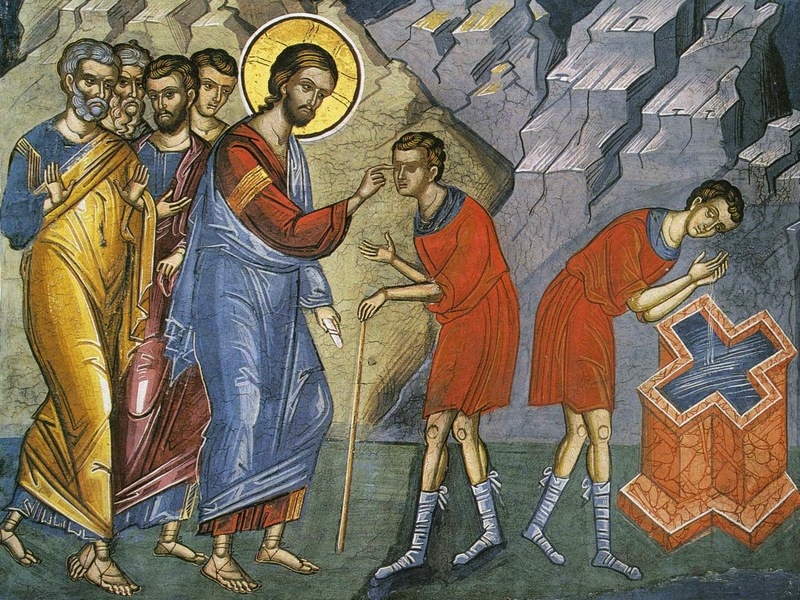 While those around him never did accept the miracle before their eyes, but breathed condemnations and slander against the work of God, the Blind Man proclaimed Christ, and was granted to see and venerate his Creator. May the Lord heal all of our blindness, and may these moving words of Elder Ephraim below help keep us from slandering our brethren (which is a great sin) and lead us all to repentance! Slander is a great evil. Just as the little rudder steers the whole ship wherever it wants, likewise the tongue leads a person either to good or to evil. 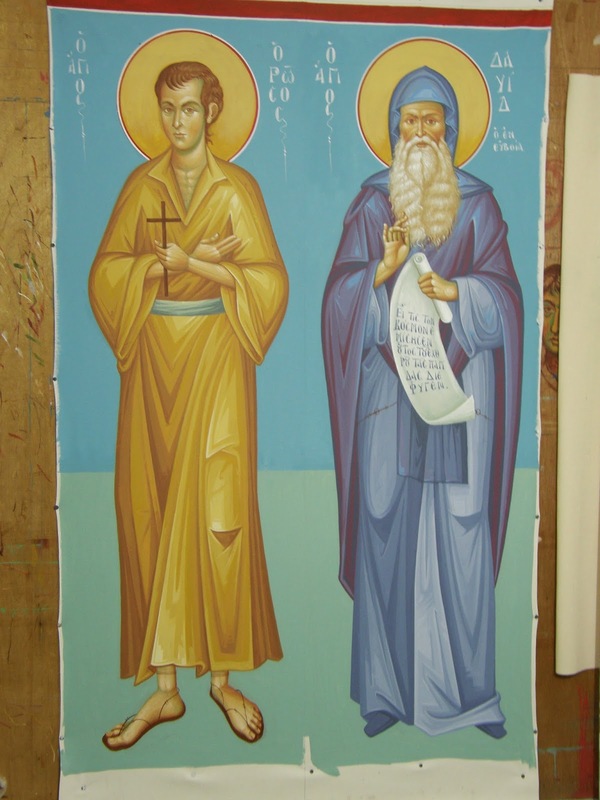 The holy fathers greatly censure judging other people’s sins, faults, or evil habits. When we judge our brother, we condemn ourselves to a great sin. But when we cover our brother, God will also protect us from great sins. When we expose our brother, we drive the grace of God away from us and He permits us to fall into the same sins so that we learn that we are all weak and that the grace of God supports us. Whoever guards his tongue guards his soul from great sins and grievous falls. The chief cause of criticism and slander is pride and egotism, because one considers oneself better than the others. For this reason it is very beneficial for a person to think of himself as below everyone, so that he considers his brother than him in order that, with the help of God, he may be delivered from this evil. Experience has shown that it is wrong to accuse and condemn someone without letting him defend himself. As also the sacred Gospel says: “Does our law judge a man before it hears him and knows what he is doing?” (Jn. 7:51 ). If we are not attentive, many sins of condemning others heap up within us, and then repentance is needed. How often a person repents because he spoke! Let us bear in mind the words of Abba Arsenios: “I have often repented for speaking, but I have never repented for keeping silent”. If we are often deceived by the sense of touch, how much more so we are by people’s words. Therefore, much attention is needed, for the devil prowls around roaring to devour us (cf. 1 Pet. 5:8 ). A Christian ought to be like the many-eyed Cherubim, for evil has multiplied greatly, especially the sin of condemnation, which is a common as “bread and cheese”. May God cleanse us and sanctify us for His glory. “Do not let the sun go down on the wrath of your brother” (cf. Eph. 4:26 ). That is, let no one be angry and enraged against his brother past the setting of the sun. have you heard about that brother who was negligent and lazy, who did not go to the all-night vigils and did not do his duties, whom the brethren knew to be a negligent monk? When he fell ill and the hour of his death drew near, the brethren gathered to hear something beneficial, or to comfort him, or in case he wanted to say something to them, but they saw him joyful, cheerful. One brother was scandalized and said, “What is this we see in you, brother? We see that you are joyful even though you are approaching death. But we have the thought that you were not a violent monk, so how do you have such courage and a cheerful face? How do you justify yourself?” “Yes, brethren”, he said, “indeed I was a negligent person and I did not fulfill my duties. But I achieved one good thing, by the grace of God: not to condemn any brother and not to scandalize anyone; and never did I let my heart have something against any brother of the monastery when the sun set. And inasmuch as I did not judge any brother, I believe that God will not judge me either, for He said, “Judge not, that you be not judged” (Mt. 7:1 ) and since I did not judge, I will not be judged”. The brethren marveled and said, “Brother, you found the way of salvation very easily”. And the brother died with much joy. Do you see how the Fathers struggled and how they found the way of salvation? "Give sight, O Lord, to the eyes of my soul..."
Give sight, O Lord, to the eyes of my soul, maimed by gloomy sin, by grafting in humility, O merciful, and cleansing me with tears of repentance. 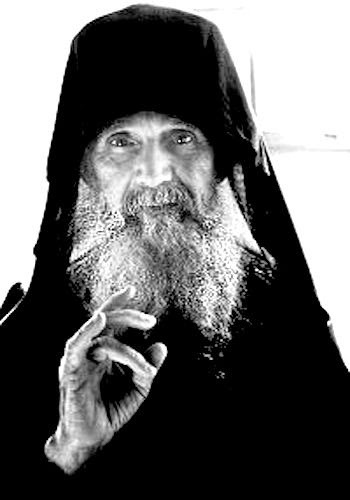 The following is a beautiful video from a pilgrim to Mount Athos, which discusses Elder Joseph the Hesychast (+1959), a true spiritual giant of the 20th century (not yet officially canonized). The video discusses his life (in Greek) and shows many pictures. More interestingly, they show video of some of the various places where Elder Joseph lived with his synodeia on the Holy Mountain. These humble dwellings are very moving to see. -3:18 - Fr. Ephraim of the synodeia of Elder Ephraim of Katounakia, of Blessed Memory, as the tour guide of the video. His kalyve (hut), named after St. Ephraim, is where his Elder lived. 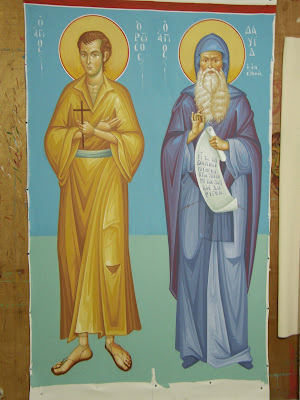 -8:20 - The kalyve of the Annunciation (essentially a cave), where Elders Joseph and Arsenios lived under obedience to Elder Ephraim the Barrel-maker. Fr. Ephraim mentions that the Elder Joseph would pray here noetically for six hours every night. -10:27 - The kalyve of St. Basil, where the Elders moved for further silence and prayer. -12:25 - The chapel at St. Basil's. Here Elder Joseph lived great deeds of ascesis and witnessed many wonders. His first synodeia lived here. -15:01 - A cave at St. Basil's where Elder Joseph lived in asceticism. -16:35 - Room where Elder Joseph slept, and where he wrote many of his grace-filled letter. -23:30 - The cave near Mikri Agia Anna (Little St. Anna's Skete) where they then moved, with the chapel built in honor of the Precious Forerunner (celebrated the feast of his nativity). -26:12 - The cells which they built to live in near Mikri Agia Anna. -34:58 - The chapel built at the grave of Elder Joseph, in New Skete. This is a special blessing, especially for those unable to travel to Mount Athos. May these places, filled with grace from the prayers and ascesis of many righteous men, help kindle our zeal for the risen Lord! And may we have his blessing! "The truth of Christ stresses that, if you praise a person, you make him an egotist. The egotist is burdened, and is guided by the devil and the evil spirit. Thus, growing up in the midst of egotism, the first act is to deny God and to be an egotistical misfit in society..."
"When, therefore, we praise the child we create this 'super-ego', we choke him with egotism, and we cause a great evil. We make him more susceptible to diabolic things..."
"In all things, we should teach children to seek the help of God...To the child you shouldn't say: 'You did it, you are the most impressive, you are young, you are brave, you are perfect!...' The child is not helped by this. You can, however, tell him to pray. Tell him: 'My child, the gifts that you have, God gave to you. Pray that God gives you His grace.' This is the perfect [way]..."
"You should tell the truth, so that the person can learn. Otherwise, you support them in their ignorance. When you tell someone else the truth, this instructs them, he pays attention, and when he hears it from others, it is strengthened. Thus, you should tell the child the truth, you should scold him, saying that that which you are doing is not good. What does the wise Solomon say? 'He who spares the rod, hates his son, but he who loves him will carefully chasten him.' However, you are not to flog him with the stick. Then we go outside the boundaries and the opposite occurs..."
"Parents are responsible first for the failures of children in life, and teachers afterwards. They praise them constantly. They speak to them with egotistical words. They don't offer the Spirit of God, they estrange them from the Church. When the children get a little older and go to school with this egotism, they flee from religion and despise it, loosing their reverence towards God, towards their parents, towards everyone. They become untamed and harsh and apathetical, without honoring religion nor God. We release egotists into life and not Christians..."
"The devil has managed to remove himself from people [directly]. and to use other names. Doctors and psychologists say continuously that a person is suffering: 'Ah, you have neuroses! Ahh, you have anxiety! ', and the like. They don't accept that the devil stimulates and excites egotism within man. And where there is the devil, there is the evil spirit...The first people, Adam and Eve, were simple and humble, and because of this they lived in Paradise. They did not have egotism...After...the devil managed to praise them and delude them. He filled them with egotism..."
"Praise makes man deaf and drives out the grace of God..."
"The grace of God comes only with holy humility..."
"We must teach children to live humbly and simply, and to not seek praise and a 'bravo'. We should teach them that humility exists, which is the health of life..."
It should also be noted, that areas in the Peloponese, Zakynthos and other Ionian Islands, etc. that the Italian ships would have passed have maintained that this “passing-by” of the Relics of St. Nicholas was a great blessing for them, and many places celebrate this festally. 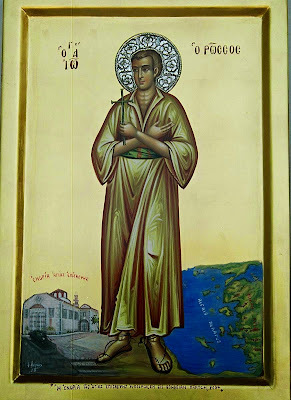 St. Nikodemos refers to this in his service, where he hymns the “passing” of the Relic of the Saint, through which he sanctified not just these areas of Greece and Italy, but “everything under the sun”. Because various areas had greeted the Relics on different days, the custom arose to variously celebrate the translation of St. Nicholas May 9th, May 10th, May 20th, or other days during that period. 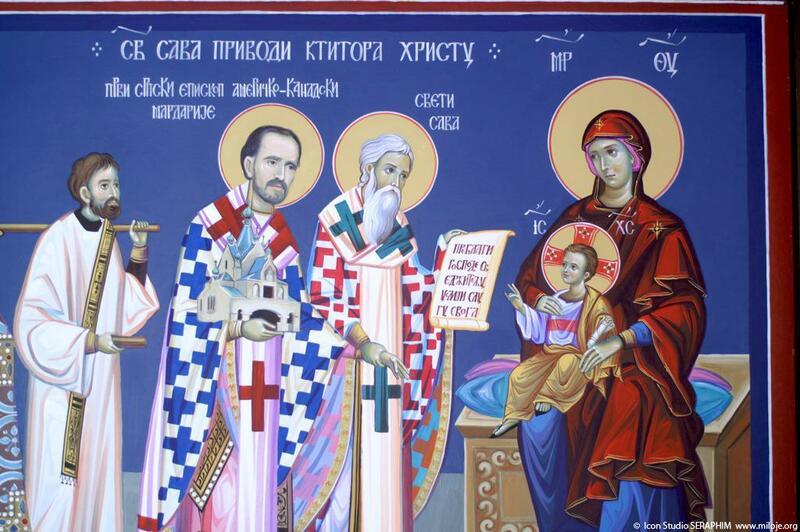 The service by St. Nikodemos was written, however, to be celebrated on May 10th. On the feast of St. Nicholas, according to St. Nikodemos, fragrant and wonderworking myrrh poured forth from the feet of his Holy Relics like two flowing springs during the duration of the Divine Liturgy. Another source mentions that when the Latin people of Bari later lost Orthodoxy, that the fragrant myrrh of St. Nicholas would no longer flow in this way, but they would need to call an Orthodox priest to serve the Divine Liturgy on the feast. Behold how St. Nicholas continues to emphasize the Divine Liturgy, and defends Orthodoxy as strongly after his repose as he did in life! 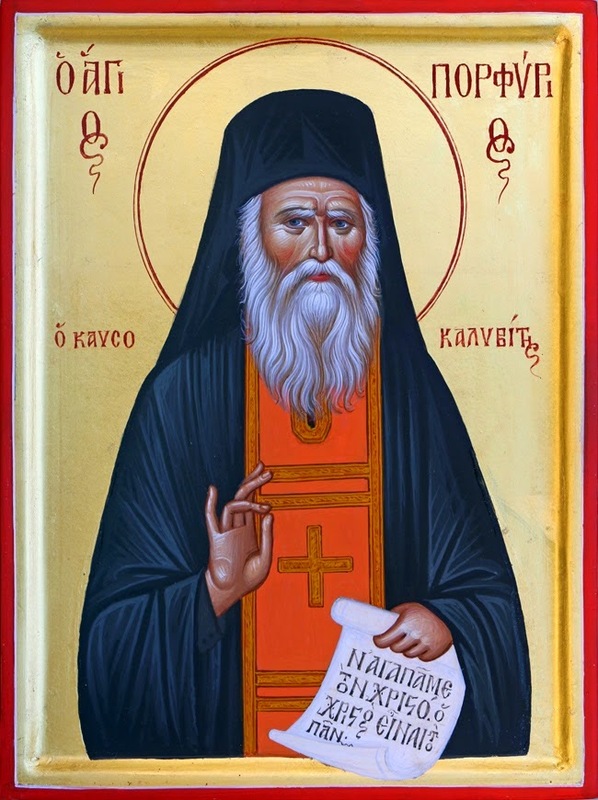 In order to honor this great Wonderworker, my weakness has translated this beautiful service that is attributed to St. Nikodemos of the Holy Mountain, as I I found it online. If there have been changes or alterations to the texts through the passage of time, I apologize. Please note that this service is not yet complete, as I don't have the time currently to translate the two Canons to the Saint in the Orthros. I hope to do so soon. Please note that nothing is set to the meter of the original melody. And I ask that you try to review the text before any public or liturgical use, as it is my amateur translation, without an editor. Truly, there are many who need the Lord's help in our troubled world. I pray that Saint Nicholas might protect and guide everyone, healing all those who suffer in body or soul throughout the whole world. After the Psalm, “Bless the Lord, O my soul…”, the “Blessed is the man…”, then at the “Lord I have cried…”, six verses (of the Prosomoia of the Saint), and two of the present feast. Stichera in the Fourth Tone. As the brave one among the Martyrs. The Church rejoices at your precious Relic, through which you have sanctified everything under the sun, and she magnifies the Lord, Who showed you forth to be the adornment of Hierarchs, and the deliverer of the faithful, therefore intercede, that deliverance from offenses be granted to those who hymn you in faith, O thrice-blessed Archbishop Nicholas. The leader of the people of Myra, the pride of the Fathers, the boast and support of the whole world, the guide towards piety, he who demonstrates dogmas, and the chosen vessel. We know you to be the fragrance of the Spirit, the treasure of the poor, and the savior and deliverer of the storm-tossed, O Nicholas, the Father of the Fathers. Having been aflame with divine zeal for Christ, O blessed one, you deposed the boldness of Arius the godless, and you preached the Son as being consubstantial with the Father, and truly equal in honor. Through His immeasurable compassion, He received our clay without confusion, and ineffably deified it, translating it to heaven. You wholly desired Christ, O all-honored one, and you followed His paths, as an all-holy Hierarch, and an all-perfect mystic, and the boast of the faithful, the supporter of the poor. Therefore, the Lord truly showed you to be wondrous with a multitude of miracles, both while alive and after your repose. Doxastikon of the Stichera in the Plagal of the Second Tone. 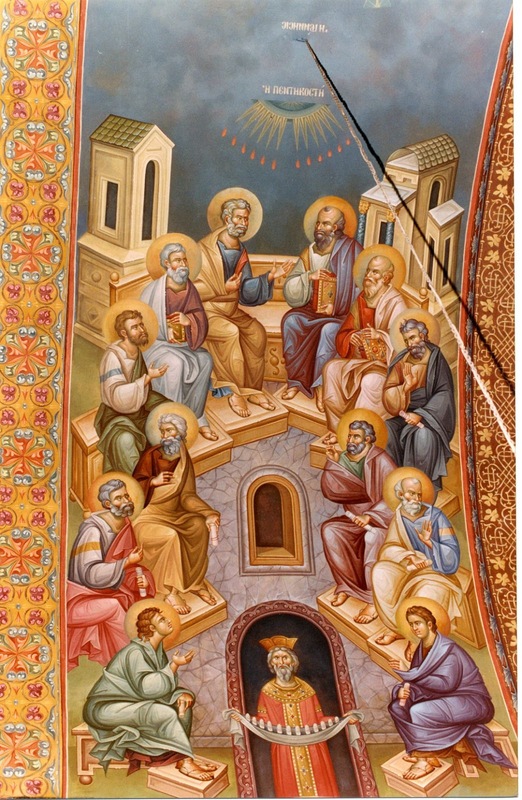 The great treasure among the Hierarchs, the unassailable surrounding wall of the Church, the boast of the whole world, and the glory and rejoicing of the Angels, let us gather to hymn him, and fervently cry out: Rejoice, you who proclaimed the Son and Word of God as consubstantial and equal in glory to the Father, God the Word, through your all-wise tongue, and through Whom you received all things. Rejoice, the protection of orphans and widows. Rejoice, the most-speedy helper of those who sail the seas. Rejoice, the most-radiant light, who sanctified everything under the sun with miracles. 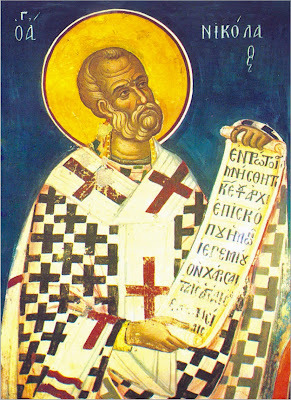 And now, be present with us, who with fervor hymn the honored passing of your divine Relic, O Hierarch Nicholas. Both now. Of the Feast. Then “O gladsome light...”, followed by the Prokeimenon of the Day, then the reading of the Hierarch. O Father Nicholas, from infancy, you desired the Lord, and abandoned the world, and counted its joys as refuse, as you distributed your wealth to the poor. You were zealous for the Angelic way, as you offered to the Master ceaseless hymns. Therefore, He Who beheld the hidden things of your soul, made you worthy of divine wonders, granting the ability to work them, and that unending blessedness of the age to come. Having reposed, you now dwell with the Angels. 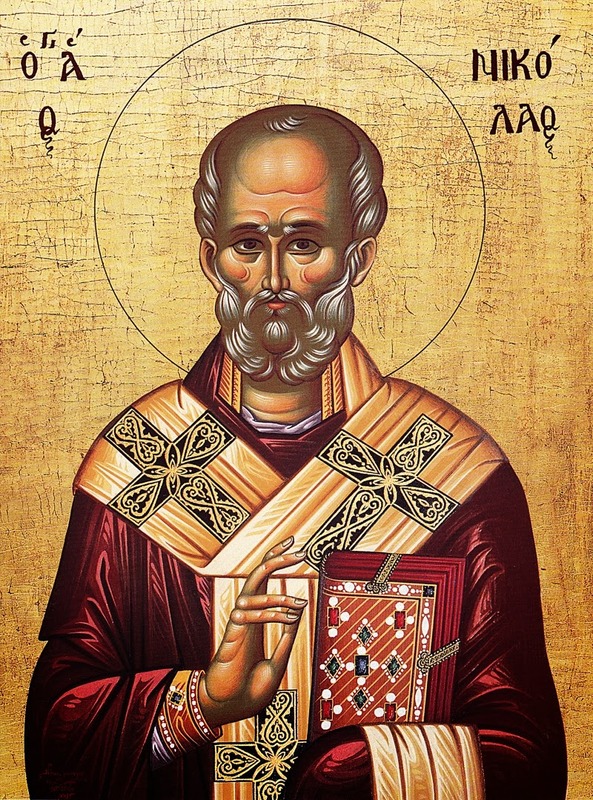 Do not cease to intercede on behalf of us, O Saint Nicholas. 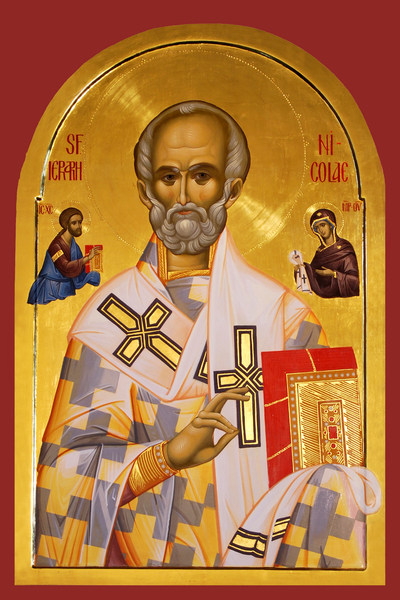 O adornment of the Fathers, divine Nicholas, the all-perfect shepherd of the sheep of the Church of Christ God, for in a godly manner you led your people towards the heavenly sheepfold, as a perfect guide, and were shown to be a nourisher of orphans, and a savior and deliverer of those who sail. Intercede on behalf of us to the Lord, who with fervor hymn the translation of your sacred and divine Relic. 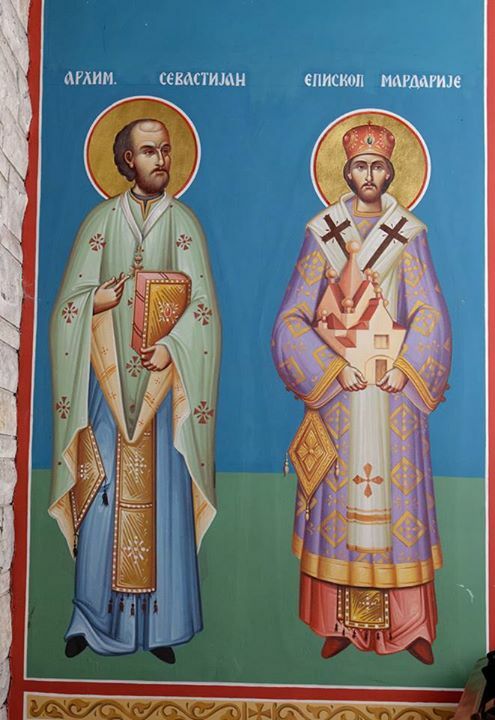 You were shown to be truly a shepherd of the Arch-shepherd, and a disciple of Christ, O Hierarch Nicholas. Therefore, you rightly condemned the Arians, and through your pastoral protection, you cast them out, and having been filled with divine zeal, you gave the godless Arius a slap, and you showed all those who were of like mind with him to be fools, giving pasture to your rational sheep. And now in the heavens, as you had laid down your life for your sheep, you receive the reward for your deeds from Christ God, and the Savior of our souls. Who would not glorify, who would not rightly bless the Arch-priest and Teacher Nicholas, whom the Holy Trinity has blessed? For he was shown to be a famed teacher of the Holy Church, an unshakable pillar of piety, and a most-exacting canon of truth, the defender of the First Ecumenical Synod, he who uproots the tares of deception of the demons, the dissolver of heretics, the guide for the deluded, the common Father of orphans, the protector of Greece which calls upon him, and the rejoicing of the whole world. Glory. Plagal of the Second Tone. Come today, O you who dwell on earth, let us celebrate with hymns of praise, hymning the divine passing of the Holy Relic of the Great and thrice-blessed Nicholas, and in faith, let us cry out, saying: Rejoice, the surpassing helper of all those who call upon you in faith. Rejoice, the faith of the poor, and the deliver and protector of those on the seas. 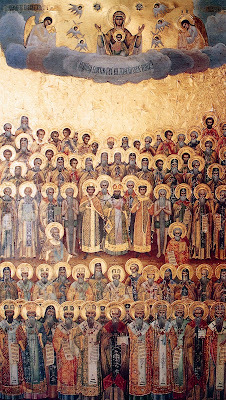 And now, entreat Christ God on behalf of us, O Hierarch Nicholas. Aposticha in the Second Tone. When You were taken down from the tree. Rejoice, the enricher of orphans, rejoice the benefactor of widows, and the savior of those who sail, rejoice the most-fervent deliverer of the innocent. The rejoicing of the faithful, the wonder of the Angels, the pillar and foundation of the Church of Christ, rejoice the pride of the Fathers, the true boast of the people of Myra, and the chaste adornment of the divine Venerable Saints. When the terrible and insane Arius moved his tongue against Christ impudently, then, at the holy Gathering, with the sling of the Spirit, you cast him out like another Goliath, from the community of the faithful. Then, being aflame with divine zeal in deed and word, you deposed him, O divine Nicholas. 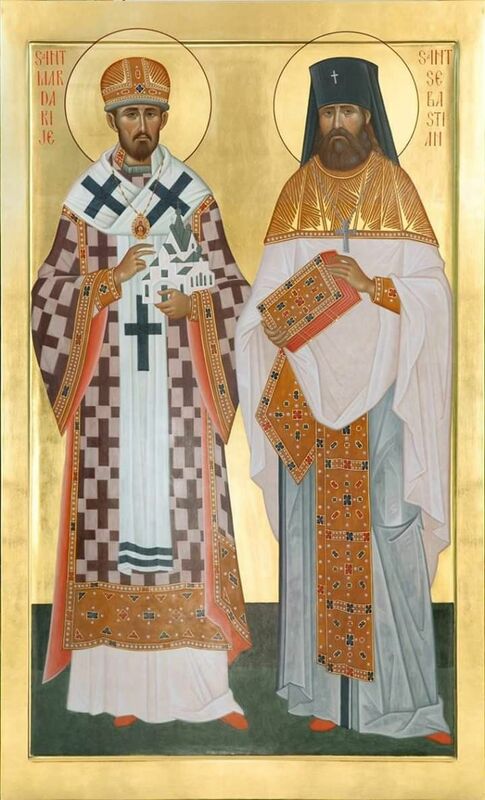 You hearkened to the word of the Prophet, as a wise Hierarch, and built temples and raised altars to Christ God, O all-wise one, and offered bloodless sacrifices, as another Melchizedek, O Holy one, as a sacred Hierarch. Therefore, the Master of all glorifies your all-precious Body before all, O Nicholas. Doxastikon of the Aposticha in the Plagal of the Second Tone. When, O all-blessed one, you delivered your soul unto the hands of the Creator, then the whole multitude of the people of Myra, of every age, surrounded the bier, and wearily shed tears upon your spotless Body, and bitterly mourned, saying: “Why have you abandoned your children, O Saint? And how will we be able to pass through the rest of life without you?” And more than this was heard: “The orphans have been robbed of their Father, the poor of their treasure, those upon the seas of their guide, those in sicknesses of their free healer, captives of their deliverer, the Priests of their Shepherd.” But, O all-holy Nicholas, do not cease to visit us from the heavens, who celebrate the memory of the honored passing of your divine Relic with fervor. The “Lord, now let your servant...”, followed by the Trisagion, then the Apolytikia. 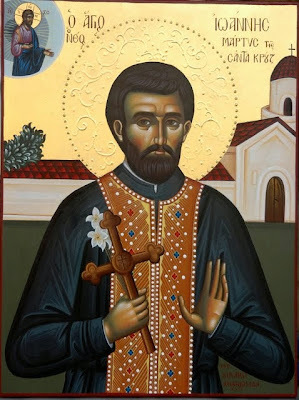 Come, let us all praise with hymns the veneration of the divine Relic of our Blessed Shepherd, as we cry out to him in joy: Help us, who are in all kinds of dangers, and who hymn you with faith, O Hierarch Nicholas. Glory to Christ Who glorified you, magnifying you with praise, for you were shown to be our radiant pride, and an image of holiness. Kathisma in Tone One. Your tomb, O Savior. Greatly has God glorified you, O Father, with all kinds of wonders during your life, for you shepherded the people of Myra with faith. After your repose, He showed your all-holy Body to be pouring-forth wonders, which we faithfully glorify. The protector of the people of Myra, the pride of Greece, you shown forth, O thrice-blessed one, in the city of Bari, dissolving their bitterness, and bringing in joy for them, O all-wise one, through the holy case of your Relics, which we praise sacredly, O all-blessed Nicholas. Kathisma in the Fourth Tone. You have appeared today. Today, the whole world celebrates reverently, at the passing of your sacred Relic, O Hierarch Nicholas, hymning Christ, Who magnified you. You appeared as a perfect worshiper of the Divine Trinity, and you served as a priest on earth in purity, O all-holy one. And now, O divine Nicholas, together with the Angels, you chant unto God with rejoicing. 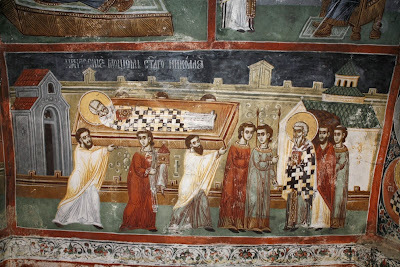 Kathisma in the Plagal of the Fourth Tone. The Wisdom and Word. The all-working grace of the Spirit wholly dwelt within you, O blessed one, and showed you to be a God-inspired Hierarch, as you spiritually and divinely shepherded your flock to your holy sheepfold in holiness. Therefore, the Master, in return for your struggles, has glorified you with incomparable wonders, O Holy Hierarch Nicholas, intercede for Christ God that remission of offenses be granted, to those who celebrate the honored veneration of your Relic with fervor. Glory. Of the same tone. The defender and protector of rulers, the providence of widows and orphans, you were shown to be, O Father, and the deliverer of the innocent, and the savior and helper of all those upon the seas, the deliverer of the sick, the adornment of the Fathers. Therefore, we who have gathered in your Church in faith hymn you, O glorious Hierarch Nicholas, intercede with Christ God, that forgiveness of offenses be granted, and that we be made partakers of His heavenly Kingdom. Verse: What shall we offer to the Lord, for all that He has given us? The foundation of the Fathers, O divine Nicholas, the worshiper of the Three-Sunned Godhead, the mystic of virtues, and the glory and rejoicing of the people of Myra, as you now stand before the Master's Throne, and dance with the Angels, intercede on behalf of us, O most-holy Father. Then the Canons to the Saint [to be translated at a later date]. Though you descended into the grave. 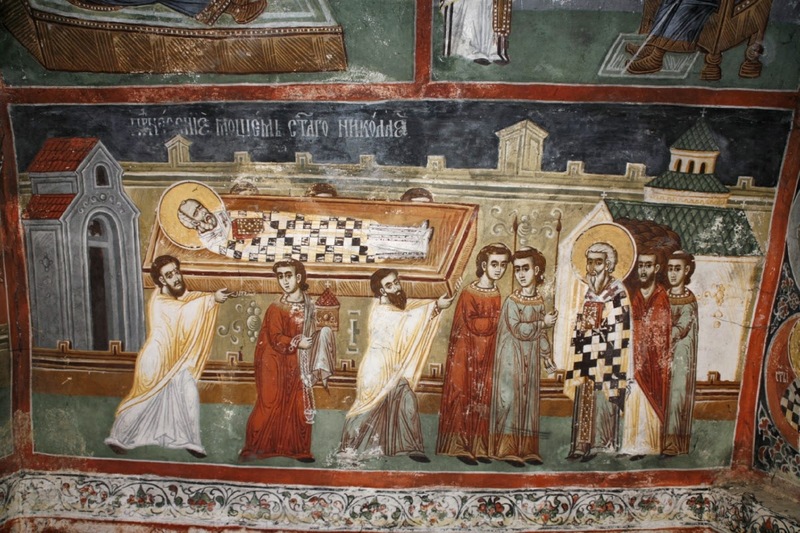 Though you descended into the grave, O Nicholas, yet you still visit us who hymn you, and as our intercessor before God, you grant speedy help to those who faithfully entreat you, O Hierarch and leader of the people of Myra. Open my mouth, O God my Savior, and fill it with divine wisdom, that I might be strengthened to worthily hymn the Great Teacher among Hierarchs, the Shepherd and Leader of the people of Myra, who was truly innocent, spotless, and in all ways blameless. The protector of widows, the Father of orphans, the entreator for sinners, the savior of the innocent, and the guide and helper of those who sail the seas. Through the passing of his Holy Relic, he sanctified everything until the sun. But being astonished by the multitude of his divine graces, I cry out to him with faith: Protect and keep the world, through your prayers, O Hierarch and leader of the people of Myra. On this day, we celebrate the Passing of the Sacred and Holy Relic of our Father among the Saints, Nicholas, Archbishop of Myra of Lycia, the Wonderworker. Nicholas, hymning him whose Body is passing on the tenth. And now has been shown working awesome wonders in the West. The Church of Christ radiantly celebrates the radiant passing of your Relic, O all-holy one, and it praises you with rejoicing. 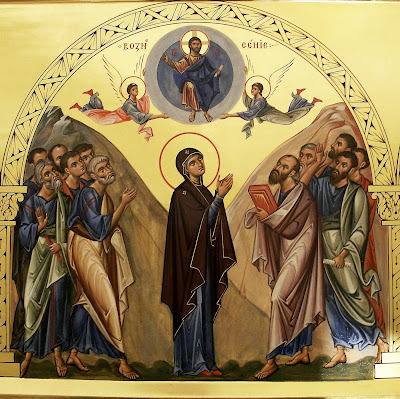 Preserve her, O thrice-blessed one, from trials, and scandals of the foe, through your intercessions to God, O Hierarch Nicholas. Tone One. The heavenly ranks. Let us praise the pride of Arch-priests, the leader of the people of Myra, the protector of orphans, the staff of rulers, and the great deliverer of the faithful, the helper of those who are in danger upon the seas, the redeemer of the innocent. The Shepherd of Priests, the nourishment for orphans, the deliverer of captives, the savior of those who sail, the giver to the poor, the unsleeping intercessor of the faithful, and the free healer of the sick, we hymn you, O Nicholas. At the light-bearing and divine Passing of your Holy Relic, the divine Church sacredly celebrates a feast with honor, for through this, you sanctified the whole world, and we hymn Jesus with praise, Who glorified you with wonders. The city of Myra knows you to be truly as another Joseph the Giver-of-grain, and a deliverer from all kinds of pains and calamities, a patron and defender. Therefore, we ceaselessly hymn you harmoniously, O most-holy Nicholas. 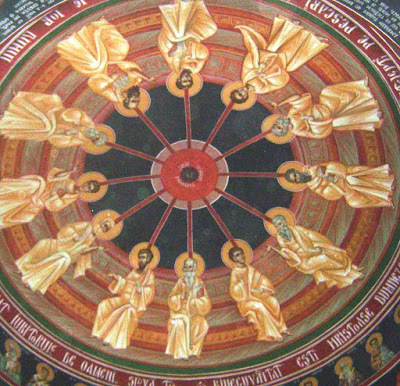 Doxastikon of the Praises in the Plagal of the First Tone. O venerable Father, you hearkened to the voice of the Gospel, freely distributing your wealthy to the poor, and thereby inheriting from Him the heavenly share, O revered one. As you stand before the throne of the Trinity, and ever chant together with the Angels the thrice-holy hymn, entreat that He have mercy on us and save us, O Saint Nicholas. The typika from the canon of the feast at the Third Ode, and of the Saint for the Sixth Ode. The Epistle and Gospel from the feast of St. Nicholas on December 6th. The memory of the righteous is unto the ages. Alleluia. In a fitting tongue, let us all hymn the holy passing of your Body with faith, therefore protect us from danger, and keep us all unharmed, for we call upon you, O divine Nicholas. Having your sacred icon, O blessed Nicholas, as a strong surrounding wall, we take refuge in all dangers, and from every trial are we redeemed. "The Source of wonders came to the source..."
"The mid-point of the days is here..."